The 16 oz. bottle is premixed at a professional strength level for maximum salt removal. Because it is professional strength, rinsing with fresh water afterward is required to flush away the salt removing solution. Salt-Away is used to dissolve and remove salt from any surface. It is water based, non-hazardous and biodegradable. It protects metals from corrosion by removing the salt that promotes corrosion. It also contains rust inhibitors that help protect the surface once the salt has been removed. Salt will cause metals to corrode. It takes very little salt on a surface to increase your chances of corrosion. Removing salt from the surface reduces your chance of corrosion. Salt-Away will actually help remove all of the salt deposits from the surface. Plain water will not remove all the salt. It is impractical to remove all of the salt from a surface using just water. 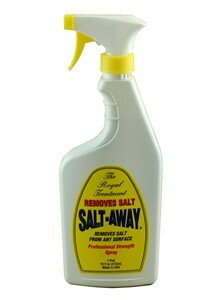 Salt-Away is water based, and when mixed with water, removes salt more completely. Salt-Away is designed to remove salt from just about any surface. It safely used on metal, paint, fiberglass, glass, rubber, plastic, chrome and many other surfaces. It doesn't contain solvents so it won't remove wax or other surface protection. 100% Non-Toxic. Safe to use around plants, children, pets and all living things. 100% Biodegradable. All ingredients biodegrade into the environment. 100% Environmentally Safe. Safe to discharge into normal drainage outlets. Contains no petroleum products or chemical solvents. Completely removes fresh salt and breaks down layers of salt. Q. Does the 16 ounce Salt-Away need to be diluted? A. No, the 16 ounce size Salt-Away does not need to be diluted. It is ready to use. Q. Does the salt disappear or is it rinsed away? A. When you use Salt-Away, the salt is rinsed away in the water. This product doesn't make salt disappear. Salt-Away greatly enhances the ability of the water to rinse the salt.